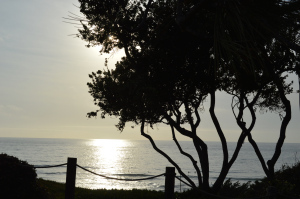 Driving up to the coastal inspired three-story Cape Rey Carlsbad, you can see the 215-room hotel is directly across the street from the legendary Ponto surf break and Pacific Ocean. This elegant property attracts families, girls getaways, weddings and surfers. 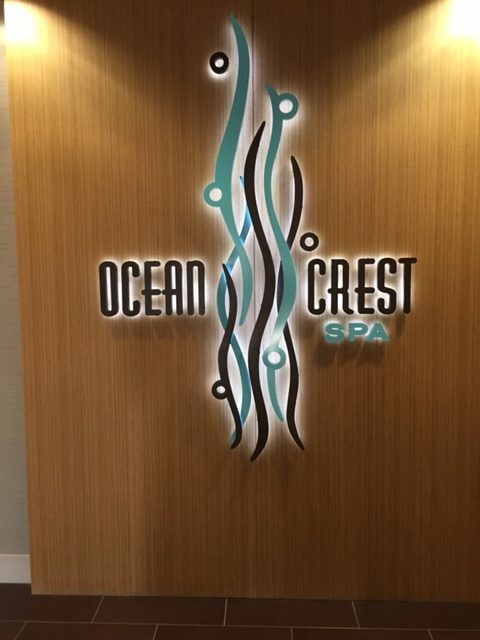 The Ocean Crest Spa offers 5,700 sq. ft of serene spa experiences, including a spacious couples suite with a tub and private outdoor relaxation area. There are separate men’s and women’s locker rooms. Across from the spa is a 24-hour fitness center with views of the pool and ocean. The spa decor features ocean elements to promote energy, serenity and calmness and to enhance beauty. There are seven treatment rooms for facials and body treatments, manicures and pedicures using products made from ingredients found in the ocean. The spa offers Osmosis harmonized H2O (water). Guests may pump five squirts into a Dixie cup to enhance their treatments. 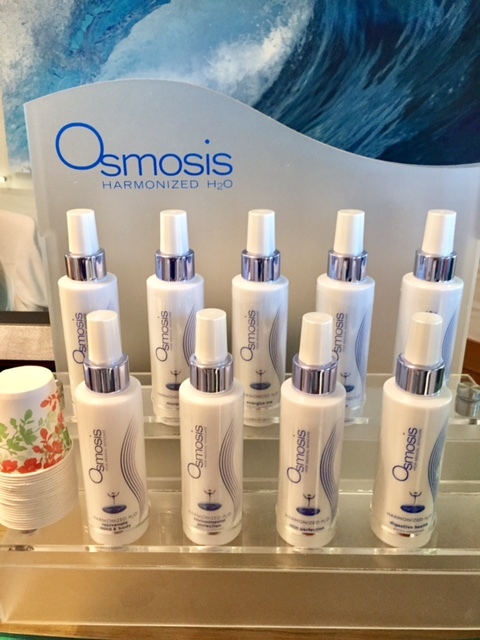 Osmosis 9 waters aid in energizing and harmonizing the body’s systems. There is cramp-free water, anti-aging water and a hangover helper. After my spa treatment, I went up to my room 310o to take in the panoramic ocean views out on the balcony. The spacious room has two Hilton Serenity beds with luxury soft bedding, a 42-inch flat screen television, in-room safe, Peter Thomas Roth amenities, white robes and complimentary Wi-Fi. Cape Rey is also an art hotel, with gallery pieces by local surf photographer Aaron Chang, Jon Prud’homme and Roy Kerckhoff. Each room has at least one piece of their art. Throughout the resort are other pieces for guests’ enjoyment. Dinner at Chandler’s restaurant is popular for guests and locals at the Sunset Terrace. This is a spectacular spot to watch the sunset while nibbling on lobster and shrimp tacos near the blazing fire pit. The restaurant offers an array of local craft beers, exotic cocktails and award-winning wines. The covered terrace offers ocean views and live music every Thursday through Saturday from 5:30 to 7 p.m., from March to October; a Sunset Terrace Happy Hour is offered daily from 4 to 6 p.m. Guests can take the Surfrider train into the Carlsbad station if they don’t feel like tackling the traffic on weekends. The property has a hotel van and BMW 7 series car for complimentary pick up for guests within a 10-mile radius. 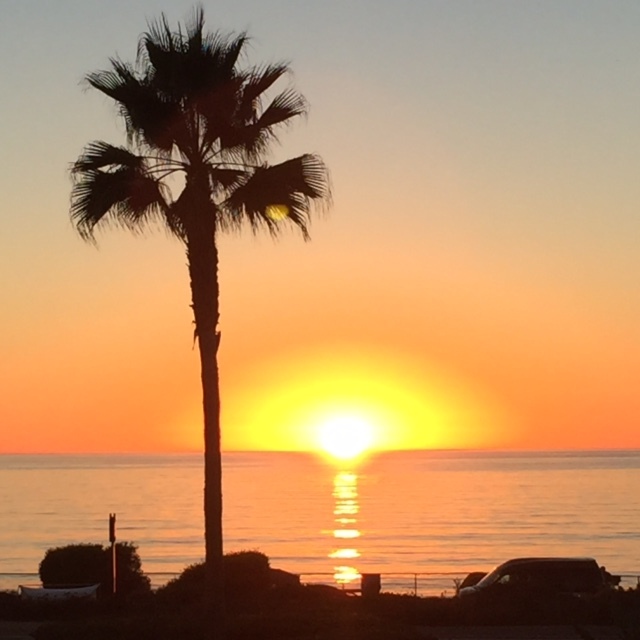 Known as a hot spot for Hollywood celebrities and Southern California locals, this Destination Hotels resort is located near Del Mar Fairgrounds and Racetrack. This luxury property pampers guests with blissful guest rooms, gratifying dining options and soothing spa amenities. Situated on 5.2 acres of verdant landscaped grounds, The Spa has been renovated by acclaimed architect Cary Collier of Blue Spas Inc., to look like a whimsical beach cottage with colorful surf boards hanging on the wall. There is an indoor and outdoor relaxation area for before or after an ocean-inspired signature treatment. The full-service spa offers massages, facials, body treatments, manicures and pedicures. The 5,000-square-foot oasis includes 10 treatment rooms, a couple’s suite and lovely outdoor relaxation areas. The Spa uses a collection of organic and vegan product lines that include Osea, Olavie, Moroccan Oil, and Skinceuticals products and their own Ocean Rescue line. 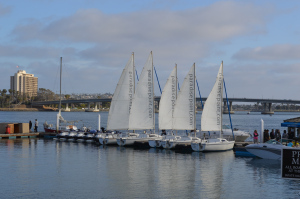 Paradise Point Resort & Spa offers an island experience in San Diego, with 462 Balinese influenced bungalow-style rooms and 73 hotel suites. Each guestroom has garden, lagoon or bay views, with island colors of coral, turquoise, chartreuse and gold. Located near the large family pool is a spa nestled among tropical foliage that surrounds this popular Mission Bay resort. The premier spa offers exotic treatments influenced from islands around the world. With 7,050-square-feet, this relaxing oasis has nine treatment rooms decorated in rich, slate tile and warm mahogany wood. Accents include bamboo and low illumination by hand-blown glass lighting. Two of the treatment rooms have wooden Ofuro tubs (Japanese soaking tubs) surrounded by loose stones and a shower area. One room has an invigorating Vichy shower. The spa also has an intimate couples’ bungalow for couples’ spa treatments. There is a serene garden courtyard with private whirlpool and a 900-square-foot nail salon and spa boutique. Professionally trained spa therapists lull the senses with Island Fresh Sugar Glow body treatments and blissful stone massages, which send body and mind on a relaxing journey. Even though San Diego is an ideal outdoor vacation destination, a few hours inside a spa in pure paradise.